Sometimes ruling the world is delicious. I just got done making my dog’s food which includes fresh raw lamb as one of the ingredients. I had some lamb meat left over, a few of the ‘use them up now’ Vidalia onions, and some great colored peppers I got on sale at the grocery store this afternoon. I wasn’t really sure what I was going to do with them, when suddenly, what emerged, as if unbidden, was my giant Army of Snails!!! The microplane made quick work of the chunks of ginger and tumeric that I had on hand, and with the chunks of Vidalia, the only other seasoning this required was some garlic, salt and pepper. Not that I’m encouraging you to make your own snail army or anything, but in case you want to tremble at our deliciousness, the recipe is below. Cut tops and bottoms off of onions. Clean off outer skin. Remove all but the outer 3 layers of the onion. Reserve the inside pieces. Chop the reserved pieces into medium dice chunks. Cut bell pepper into 4 lengthwise sections. Remove seeds and membrane from each slice. 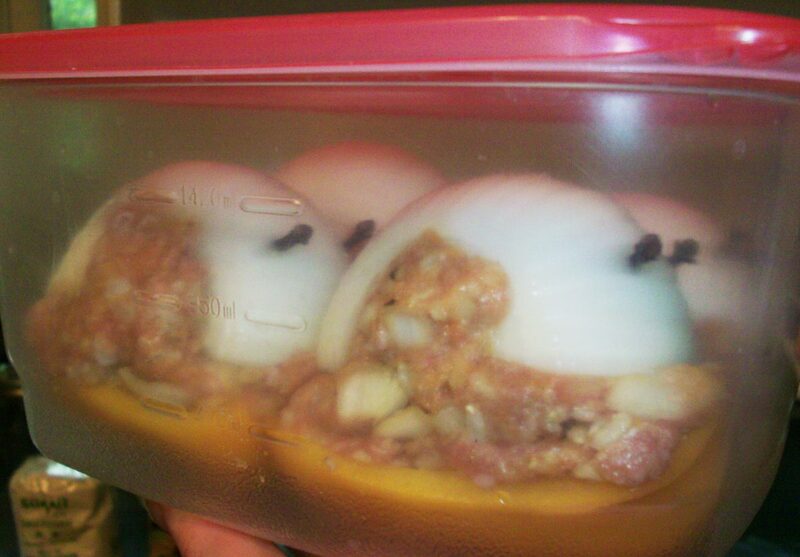 Mix lamb meat, brown rice, egg, and onion chunks. With a microplane, finely grate the ginger and turmeric into the bowl. Add the garlic, salt and pepper. Mix until thoroughly combined. 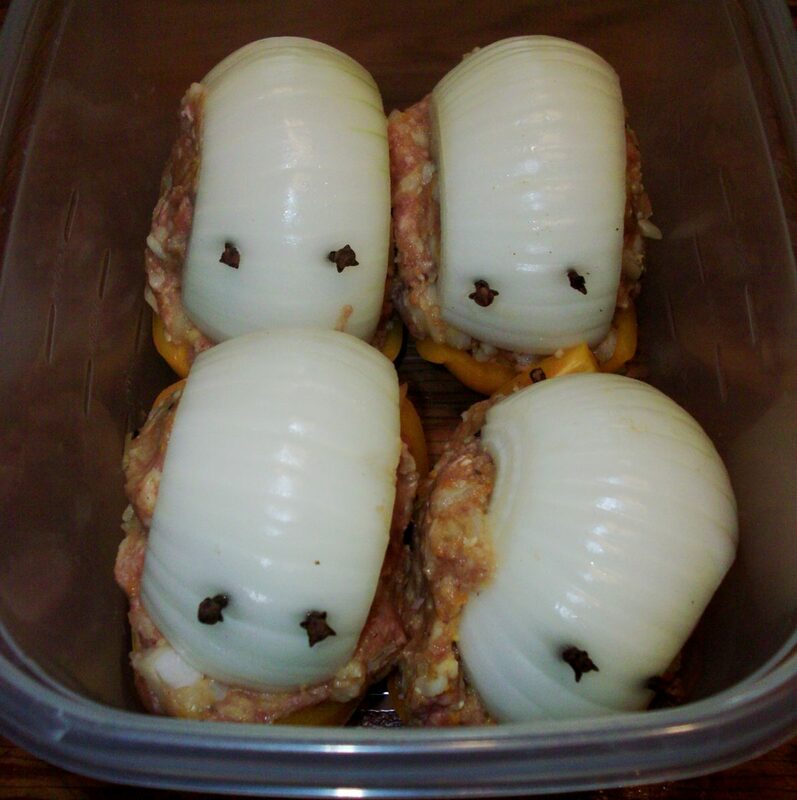 Fill the inside of each onion dome, and put a shallow layer of meat filling into the pepper as well. Firmly press an onion ‘body’ and pepper ‘foot’ together. Add two cloves to one end of each snail. Ready the army by baking on a lightly oiled pan, covered with foil for 45 minutes at 350°. If they are not brown enough to your liking, remove the foil and finish in a hot oven for 10 minutes. Reserve your snail minions by placing them in the freezer on a tray to freeze solid, then move them into an air tight container until ready to use (within 3 months). Allow to thaw completely in the refrigerator before baking. This entry was posted in Gluten-Free, Herbs and Spices on May 17, 2013 by Chef Christy.